PaperPort Professional 14 is the most productive and cost effective way for everyone in your office to scan organise, find and share scanned paper, files and photos. 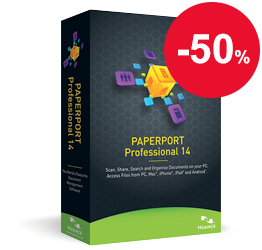 PaperPort Professional 14 combines the efficiency of document management, the convenience of perfectly scanned documents and the power of PDF document creation - all in one easy-to-use application. Millions of people worldwide rely on PaperPort to eliminate paper, get more organised and streamline the way they work. The Nuance Cloud Connector application: Now you can gain access to a number of cloud services, including Windows Live SkyDrive, Google Docs, Box.net and many more. Plus, files are accessed in the PaperPort folder directory, so you can scan, stack or unstack PDF files and create PDF files which are automatically uploaded in the cloud. Enhanced network folder support: PaperPort Professional 14 now takes advantage of fast, reliable thumbnail viewing of documents stored on shared network folders. Additionally, PaperPort Professional 14 locks files in use over the network to prevent problems that may occur when more than one person tries to view or modify the same file. Windows file and folder options available directly from PaperPort: In PaperPort Professional 14, the Windows Context menu is supported by right clicking on any file, so you can access Windows or other software and perform key tasks, including compressing and uncompressing ZIP files. Scanning improvements: We’ve enhanced PaperPort’s scanning capabilities in PaperPort Professional 14, so scanned colour documents using PDF-MRC compression are now up to 62% smaller than with earlier MRC technology. Other time saving highlights include scan and open a document with one press of a button, create and save default custom file names and create PDF/A directly from your scanner. New workspace options for greater productivity: With PaperPort Professional 14, there’s no need to remember where you put a recently scanned or opened file. New buttons have been added for “recently scanned” and “recently opened” documents, so you can quickly jump back to a folder that contains a recently scanned or opened document. Scanning improvements: Folder notes for all incoming PDF files: You can right click on any folder in the folder directory and get an option to add notes directly to that particular folder. Now these notes can be applied to PDF files that are added into such folder by moving, copying or drag-and-dropping. This enhancement is useful for applying information to PDF documents that are common to all files in a particular folder, such as contact information (e.g., name, address, telephone number); project or customer IDs; or numbers, reminders, document descriptions and more. Improved desktop thumbnails for PDF: In PaperPort Professional 14 the PDF document thumbnails offer more information about PDF documents to save you time and focus on more important tasks. A large information icon now appears in the upper left hand corner of PDF document thumbnails, indicating the file contains keywords and descriptive text. Hover over the icon and it will display the information so you don’t have to open the file. Support for Windows 7 Jump list: Now you can use the Jump list for PaperPort Professional 14 in Windows 7 to scan documents or access recently opened or scanned files instantly without having to open PaperPort first. These help you work faster and easier. Support for favourite web page bookmarks: Now you can select from any of your stored favourite web page links using PaperPort 14 and open within your browser application. PaperPort 14 presents you with the list of the saved bookmarks of your Internet Explorer, Firefox or Chrome browsers so you start browsing from PaperPort.